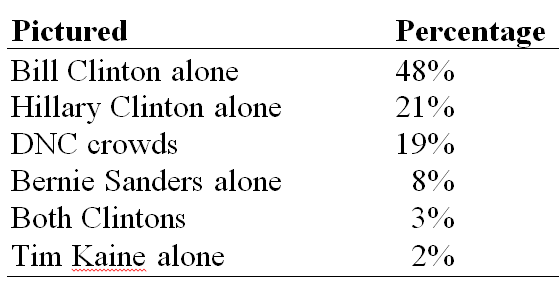 Somehow more than three-quarters of newspapers used photos of someone other than the nominee. Nearly the same number of newspapers showed pictures of the crowd at the DNC as the number that showed Hillary Clinton. A non-trivial number of newspapers only showed pictures of Senator Bernie Sanders and a few featured pictures of Vice Presidential Nominee Tim Kaine. So, why? Why did nearly half of the U.S. newspaper front pages Wednesday morning show only pictures of Bill Clinton? (1) Journalistic norms. Journalism is governed by a set of norms. One requires that any photo that illustrates an event should be taken from the event itself. Some have suggested that since Hillary Clinton wasn’t physically in attendance at the convention Tuesday evening, reporters couldn’t use a photograph of her. That fact that 21% of newspapers did use an image of Hillary Clinton, though, suggests that this can’t fully explain the numbers. Of the 55 images of Hillary Clinton, 21 used photographs of her video appearance at the convention; the rest used file photos. She may not have physically been there, but front pages like that of The Boston Globe and Newsday (below) show that journalistic norms can’t explain her overwhelming absence. (2) Hostile sexism. 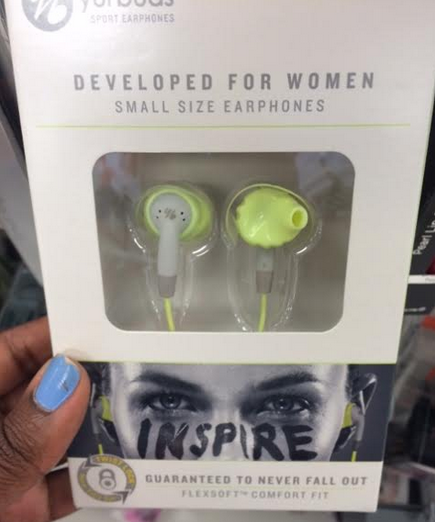 Sexism that’s hostile is aggressively and proactively anti-woman. Is it possible that some journalists are so uncomfortable with or opposed to a female presidential nominee that they just couldn’t stomach putting Hillary Clinton’s face on the front page? Maybe. 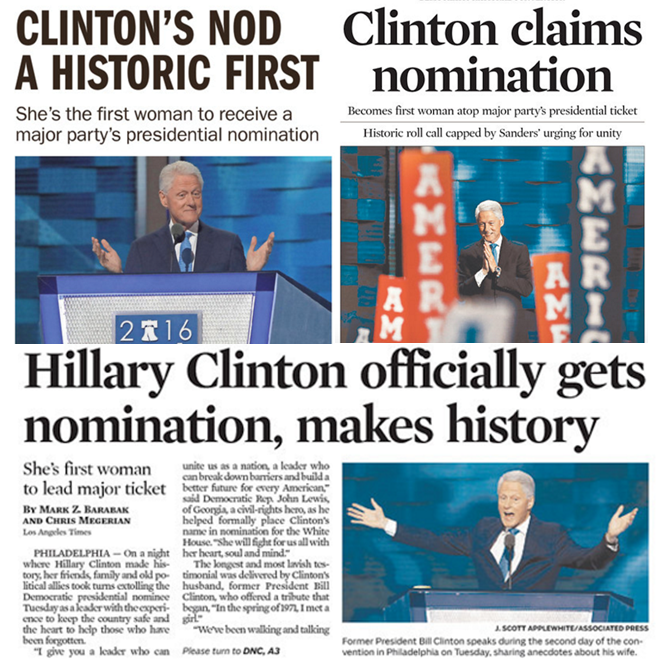 There might be a few overtly sexist journalists who just refused to put Hillary on the cover, but that probably doesn’t explain such a high percentage of newspapers with no picture of the nominee. 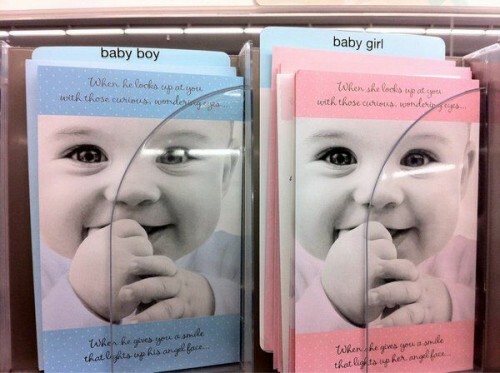 (3) Supportive sexism. Perhaps journalists (unconsciously) felt that an important thing about her nomination was that she was endorsed by men. Political authority – the authority to speak in the public about political issues — is a masculine authority usually held by men. As a male politician and former president, Bill Clinton’s image lends authority to Hillary Clinton’s historic nomination. His words about her (his “nod”) have weight, giving legitimacy to her candidacy for an office that has always been held by a man. 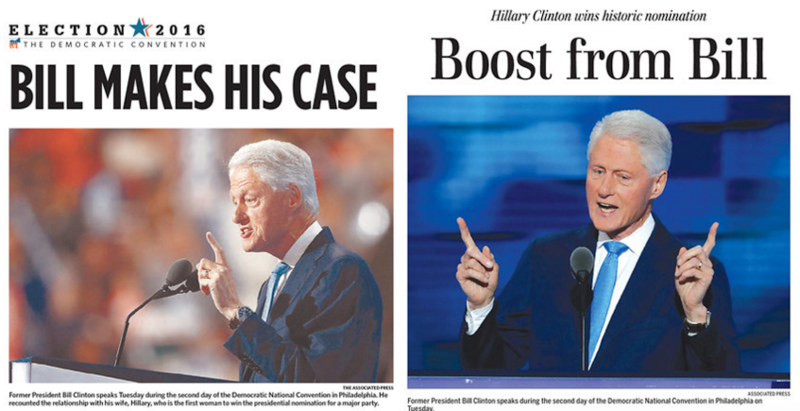 Headlines read “He’s With Her!” and another said “Bill makes his case!” She earned “Bills praise” and got a “boost.” Maybe some journalists intuited that that was the real story. (4) Bill Clinton’s own gender barrier. 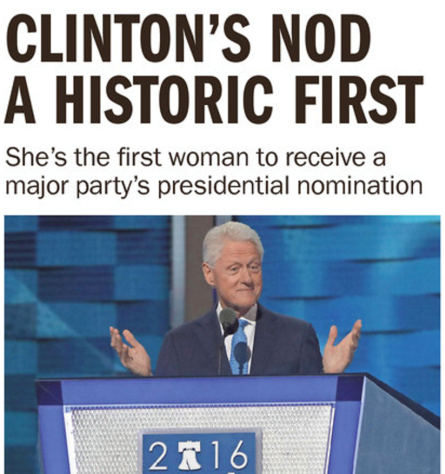 Former President Bill Clinton also gave a historic speech Tuesday evening as the first male spouse of the first female presidential candidate. 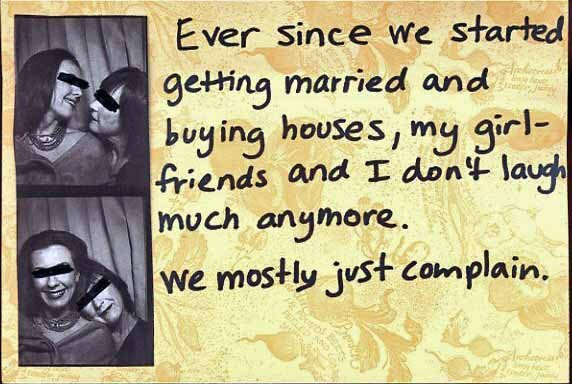 As Rebecca Traister wrote for New York Magazine, “for the first time, the spouse wasn’t a wife. It was a husband, who was … [performing] submission.” Perhaps men’s gender bending is more inherently interesting since masculinity is more limiting for men than femininity is for women. Or maybe this is a more subtle form of sexism: finding things men do inherently more interesting just because men are doing them. 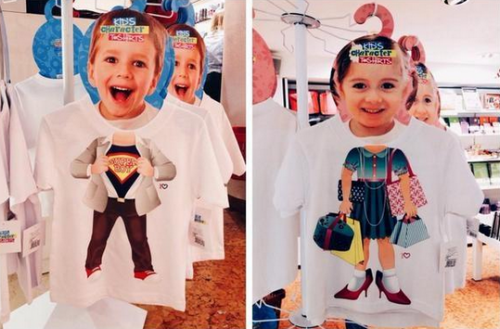 (5) A (gendered) failure of imagination. Maybe Bill Clinton appeared on so many covers because there was no one in the newsroom to notice that putting him on the front page was weird. Or no one with the authority and gall to speak up and say, “Uh, shouldn’t we use a picture of Hillary instead of Bill?” This may reflect the gender gap in journalism. Three out of five print journalists are male. It’s probably even more skewed at the top. With so many male journalists working on front pages across the country, it is plausible that they just didn’t think about gender or those that did were afraid to speak up. All these explanations together, and likely ones I haven’t thought of, help explain why Hillary Clinton’s face was so absent from the story about her historic moment. The consequences are significant. 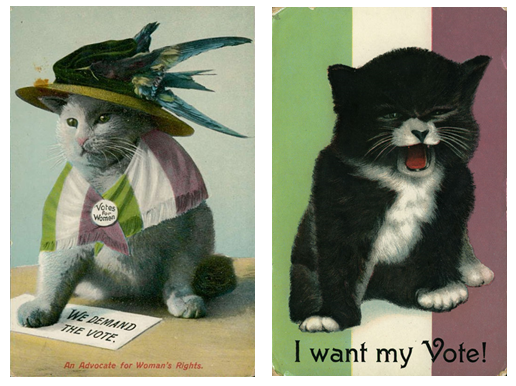 Politics is still largely a man’s world, and conceptualized in terms of masculinity. U.S. politicians are overwhelmingly male. Only 6 state governors are female, and only 19.3% of U.S. representative seats are filled by women. Only 20 women serve in the U.S. senate. Showing images of a male politician, Bill Clinton, when a female politician has earned an historic victory, only continues this gendered order of politics. Wendy M. Christensen is a professor of sociology at William Paterson University. Her research interests center on gender, the media, political mobilization, and the U.S. Armed Forces. You can follow her on twitter at @wendyphd. Is the “Mrs. Degree” Dead? 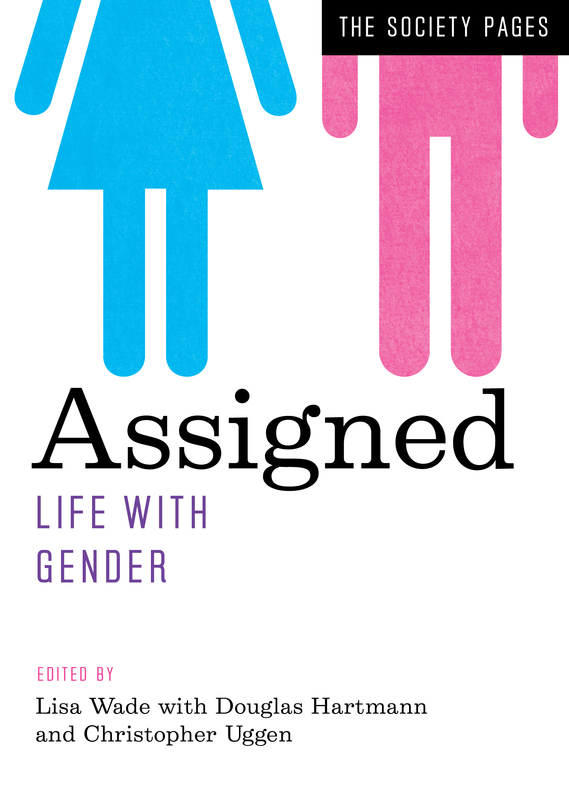 Assigned: Life with Gender is a new anthology featuring blog posts by a wide range of sociologists writing at The Society Pages and elsewhere. To celebrate, we’re re-posting four of the essays as this month’s “flashback Fridays.” Enjoy! And to learn more about this anthology, a companion to Wade and Ferree’s Gender: Ideas, Interactions, Institutions, please click here. In 1998 I was a first-year student at DePauw University, a small liberal arts college in Indiana. A floor-mate of mine, with whom I hung out occasionally, told me over lunch that she was at college primarily to find a “good husband.” I nearly choked on my sandwich. 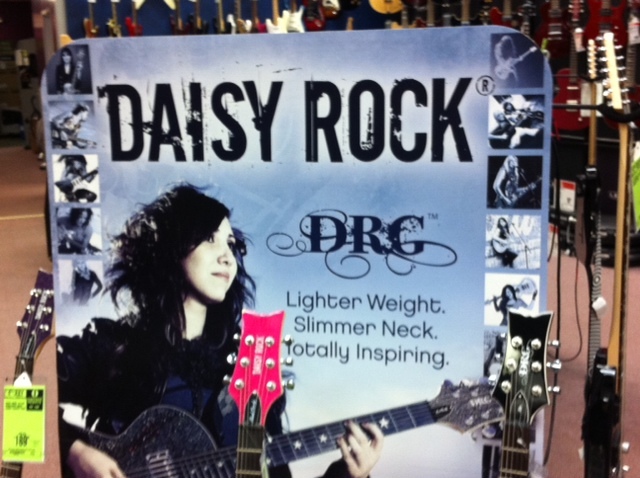 I had assumed that the notion of the “Mrs. Degree” was a relic of my parents’ era—if not my grandparents’. Surely it had gone the way of the home economics major and women’s dormitory curfews. Years later, I — along with my co-director, Elizabeth A. Armstrong — would embark on a five year ethnographic and longitudinal study of a dormitory floor of women at a public flagship in the Midwest. As part of my dissertation, I also interviewed the women’s parents. What I found brought me back to my first year of college. 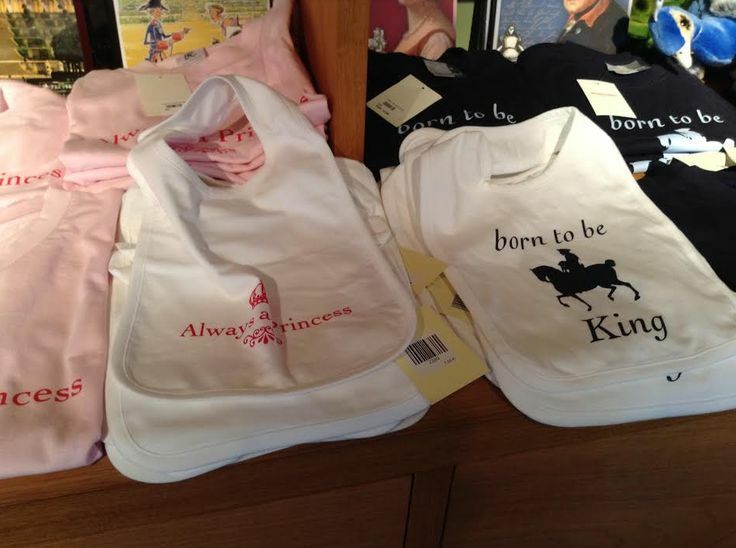 A subset of parents wanted their daughters to be “cookie-baking moms”—not successful lawyers, doctors, or businesswomen. They espoused gender complementarity—a cultural model of how women should achieve economic security that relied on a co-constructed pairing of traditional femininity and masculinity. That is, men were to be economic providers and women supportive homemakers. 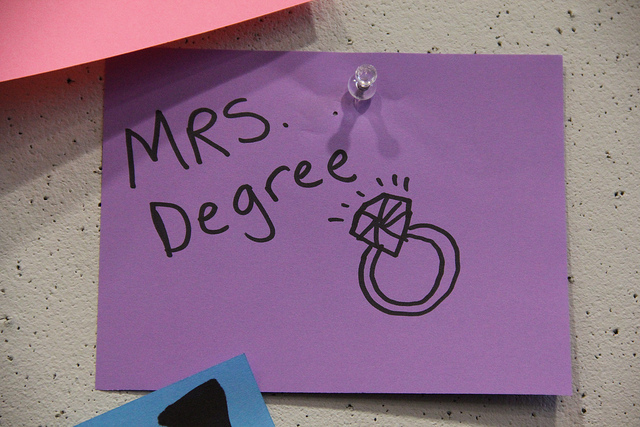 This was a revised “Mrs.” Degree, in the sense that marriage during college, or even right after, was not desirable. College women were to build the traits and social networks that would hopefully land them a successful husband eventually, but it was assumed best to wait until men had proven themselves in the labor market before entering a marriage. This was not the only cultural model to which women on the floor were exposed. In fact, those coming in primed for complementarity were in the minority. However, as I show in my article, “The Revised MRS: Gender Complementarity at College,” far more women left college leaning toward gender complementarity than their previous gender socialization suggested. Something was happening on the college campus — where women were, ironically, out-achieving men — that shifted them toward performing an affluent, white, and heterosexual femininity, marked by an emphasis on appearance, accommodation to men, and a bubbly personality. I argue that gender complementarity is not just a characteristic of individual women, but is actually encouraged by the institutional and interactional features of the typical, four-year, public state school. Midwest U, like other schools of its kind, builds a social and academic infrastructure well-suited to high-paying, out-of-state students interested in partying. The predominately white Greek system — a historically gender-, class-, and racially-segregated institution — enjoys prominence on campus. An array of “easy” majors, geared toward characteristics developed outside of the classroom, allow women to leverage personality, looks, and social skills in the academic sphere. These supports make it possible for peer cultures in which gender complementarity is paramount to thrive. Women who want to belong and make friends find it hard — if not impossible — to avoid the influence of the dominant social scene on campus, located in fraternities and Greek-oriented bars. This structure of campus life is not incidental. In recent years, cuts to state and federal support for higher education have led mid-tier public institutions like Midwest U to cater to the socially-oriented and out-of-state students who arrive with gender complementarity interests. These class-based processes have implications for the type of social and academic climate that all students find upon arriving at Midwest University. The problem is, however, that most women need to accrue the skills and credentials that translate into a solid career. An institution supporting gender complementarity does them a serious disservice — potentially contributing to gendered differences in pay after college. The situation is particularly problematic for students not from the richest of families: Affluent women espousing complementarity form the type of networks that give them reasonable hope of rescue by a high-credentialed spouse, and heavy parental support means that they can afford to be in big cities where they mix and mingle with the “right” men. Women from less affluent backgrounds lack these resources, and are often reliant on their own human capital to make it after college. The gradual shift from higher education as a public good — funded heavily by the state — to a private commodity — for sale to the highest bidder — has significantly stalled not only progress toward class equality, but certain forms of gender equality as well. Change is going to require unlinking the solvency of organizations like Midwest U from the interests of those can afford, and thus demand, an exclusionary and highly gendered social experience. Laura T. Hamilton, PhD is an assistant professor of sociology at the University of California, Merced. Her recently published article, “The Revised MRS: Gender Complementarity at College,” appears in the April 2014 issue of Gender & Society; this post originally appeared at their blog. She is the author of Parenting to a Degree: How Family Matter’s for College Women’s Success and, with Elizabeth Armstrong, Paying for the Party: How Colleges Maintain Inequality. 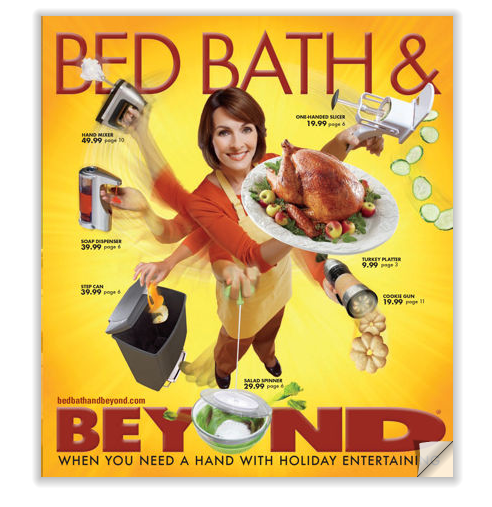 In it, Walzer argued that women do more of the intellectual and emotional work of childcare and household maintenance. They do more of the learning and information processing (like buying and reading “how-to” books about parenting or researching pediatricians). They do more worrying (like wondering if their child is hitting his developmental milestones or has enough friends at school). And they do more organizing and delegating (like deciding when towels need washing or what needs to be purchased at the grocery store), even when their partner “helps out” by accepting assigned chores. For Mother’s Day, a parenting blogger named Ellen Seidman powerfully describes this exhausting and almost entirely invisible job. I am compelled to share. Her essay centers on the phrase “I am the person who notices…” It starts with the toilet paper running out and it goes on… and on… and on… and on. Read it. She doesn’t politicize what she calls an “uncanny ability to see things… [that enable] our family to basically exist.” She defends her husband (which is fine) and instead relies on a “reduction to personality,” that technique of dismissing unequal workloads first described in the canonical book The Second Shift: somehow it just so happens that it’s her and not her husband that notices all these things. But I’ll politicize it. The data suggests that it is not an accident that it is she and not her husband that does this vital and brain-engrossing job. Nor is it an accident that it is a job that gets almost no recognition and entirely no pay. It’s work women disproportionately do all over America. So, read it. Read it and remember to be thankful for whoever it is in your life that does these things. Or, if it is you, feel righteous and demand a little more recognition and burden sharing. Not on Mother’s Day. That’s just one day. Everyday. Cross-posted and in print at Money.